The Executive Committee of the Chattanooga-Hamilton County Hospital Authority Board is scheduled to meet in closed session on Wednesday, April 17 at 4:00 p.m. in the President's Office at Erlanger. 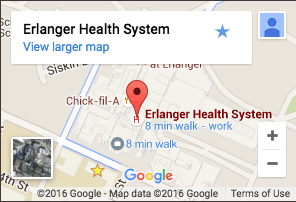 The Planning Committee of the Chattanooga-Hamilton County Hospital Authority Board is scheduled to meet in closed session on Monday, April 22 at 3:30 p.m. in the EROC Conference Room at Erlanger. The Budget and Finance Committee of the Chattanooga-Hamilton County Hospital Authority Board is scheduled to meet in open session on Monday, April 22 at 5:00 p.m. in the POB Conference Room at Erlanger. The Audit and Compliance Committee of the Chattanooga-Hamilton County Hospital Authority Board is scheduled to meet in closed session on Thursday, April 25 at 3:30 p.m. in the Board Office Conference Room at Erlanger. The Chattanooga-Hamilton County Hospital Authority Board is scheduled to meet in open session on Thursday, April 25 at 5:15 p.m. in the POB Conference Room at Erlanger. Executive Committee Apr. 17 4:00 PM Pres. Ofc. Audit & Compliance Committee Apr. 25 3:30 PM Board Ofc.